Today most describe the schools, colleges, and programs of the Academic Health Center as sharing a common research and applied interest in the health sciences. Yet, in this 1968 memo the concept of health sciences required quotes to offset it for the reader. 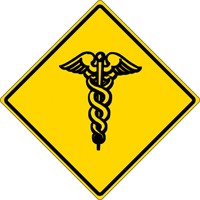 At that time, the University of Minnesota had a College of Medical Sciences that consisted of the Medical School, School of Nursing, and School of Public Health with a dean of the Medical School and directors of nursing and public health who reported to the dean. There was also a College of Pharmacy and a School of Dentistry that each reported directly to Central Administration. The College of Veterinary Medicine also reported to Central Administration while maintaining close ties to both the College of Medical Sciences and the College of Agriculture. In the memo, Dean Robert Howard announces to the faculty of the College of Medical Sciences the framework of an applied “health sciences concept” at the University while maintaining the existing administrative structure. It emphasizes the importance of “interrelatedness” and “interdependence” in the existing programs and the need to identify other programs “that are indeed ‘health-science-wide’ in scope.” It could be argued the term “health sciences” preceded the concepts of interdisciplinary and interprofessional programs and thus makes its description somewhat difficult and anachronistic. Dean Howard states that the projected outcome of the proposal would be twofold. First, it would re-brand the existing University of Minnesota Medical Center as the University of Minnesota Health Sciences Center. 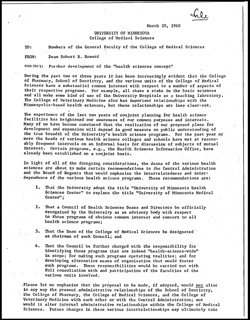 And second, it would “initiate an intensive study of the administrative structure.” This second point leads ultimately to the reorganization of the health sciences and the formation of what is now the Academic Health Center in July of 1970. Read the full 1968 memo below.